These affordable flower pot ideas are fun and easy to DIY. From painted terracotta pots to recycled household items transformed into plant vessels, there is an idea here for everyone. This simple DIY is super chic and you don't have to be artistic to pull it off! Use rubber bands and painters tape to create perfectly straight lines and stick to a minimal color palette for a coordinating look that would look great anywhere in your home. Add some pattern to your living space by updating a terracotta pot by painting the pot with acrylic paint and adding dots using a permanent black marker. 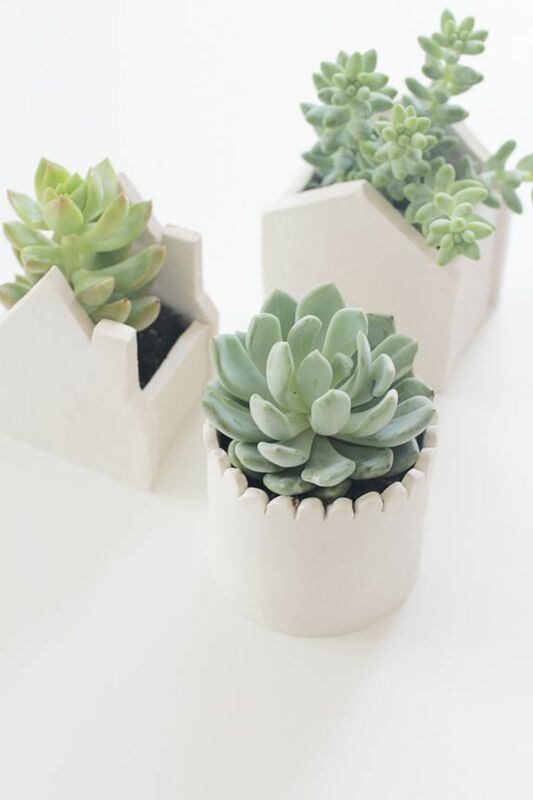 These adorable mini planters are perfect to make with your kids. Decorative tape and permanent markers go a long way here with a little bit of creativity. Adding large granite or marble planters to your home or patio often is an expensive purchase, but you can easily create your own stone planter by taking 5 square stone tiles used for walkways or patios and caulk the sides together to create your own DIY stone planter. Add some flowering plants or fresh herbs to the railing of your deck by building your own flower box out of 4′ x 8′ plywood that you can attach to the side of your deck. Transform your wooden flower box planter by staining adding glass tiles to the exterior to give the planter a fresh new look. This DIY marble planter looks so expensive yet it is actually very affordable to make as it uses marble contact paper to cover the exterior to give a pot a fresh new look. 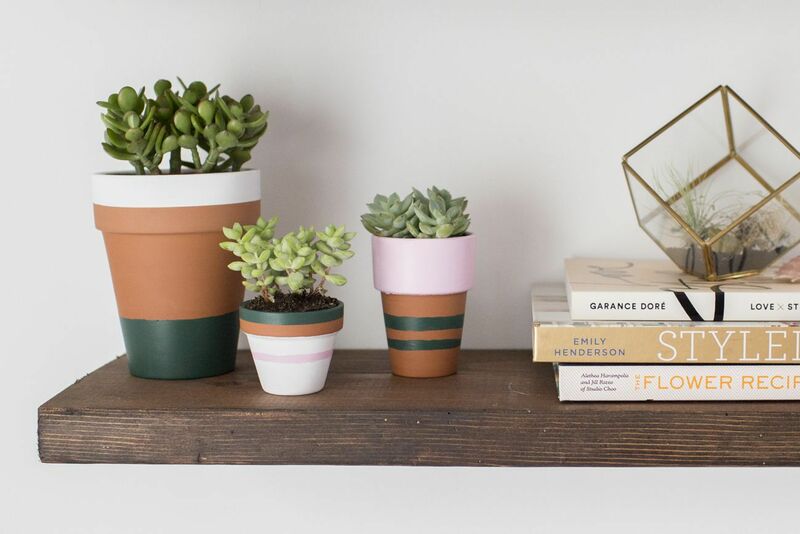 Ombre is still holding strong as a popular design trend, and one easy way to incorporate this look into your home is by making a DIY ombre plant pot. To create your own ombre pot take any pot and paint the entire pot a light color. Once the paint dries, flip the pot over and use a darker color of spray paint to spray the bottom of the pot to create an ombre finish. Grab a paintbrush and your favorite color of craft paint to update your terracotta pot by freehand painting an ikat design. It is easier than you might expect to do as you are simply painting diamonds increasing in size to create the design. Break out the painter's tape and use it to mask a herringbone pattern on a plant pot, then paint over the remaining exposed areas of the pot to create your own herringbone planter. Express your creativity by hand sculpting a non-typical plant pot shape, such as the clay houses pictured here using oven bake clay that creates a stunning pot you cannot find in stores. Go ahead and make a few of these recycled can herb pots and get started on your own herb garden to use for cooking. Recycled your food cans by cleaning them out and painting them with spray paint to change the exterior color, and add a chalkboard label on the front to write down the herb growing inside. Add a punch of color to your space with a bright neon pot that you can make in minutes by painting the lower half of a terracotta pot. Break out your office supplies, as you will need round sticker labels cut in half to create the scallop pattern on this cute planter. Build two of these gorgeous outdoor plants to flank either side of your front door to enhance your home's curb appeal. Jazz up your bland glass vases by spray painting them white and adding copper foil lines to create a beautiful planter perfect for small succulents.